Hey. Just wanted to drop a note that repology.org, a service which monitors and compares packages across a lot of repositories, has also support for freshcode. It works both ways: information from freshcode is used to discover new software releases and thus packages which need updating, and information from repositories and upstream may be used to update freshcode. Here's list of projects outdated on freshcode, for instance. however it's not complete as I'm only accumulating information from RSS, so it only contains packages update during latest 3-4 months. Is there a way to get full database? Well, there have been a few (actually rather few) spammy submissions lately. As expected we had the commonplace medical product tips. But there've also been a few subtle proprietary / non-FLOSS products advertised. So, a big thanks to all who took the time to flag those recently! Hmm. Seems that backslash character was eaten from "Changes". Even duplicating it did not worked. Submit for do not tell which characters are reserved. To filter non-regular-text. Which is too avoid too programm-y content. While sure, programmers is certainly a main audience; the changelogs are usually not that fine-grained or meant to be excessively technically. Your entry is shareable under the CC-BY-SA license. "entry" here refer to submitted text and not actual project or program ? It's open source / libre / Free software or pertains BSD/Linux. Hi Kari. That's true; I just stumbled over it the other day myself. So I'm gonna reword that to "description / text". The Elm license of course is also on-scope here. If you want you can flag it for moderator attention later, and I'll add e.g. "Elm GPL" as specific license marker to your project listing. Also, thanks for the input and taking the time to resubmit your freecode project here! I had problems with version numbers on freecode. One reason also was that they removed branches on site update. "Elm 2.4ME+" -branch aka "Elm Millennium Edition 2.4"
"ELM ME+ 2.5" -branch aka " Elm Millennium Edition 2.5"
"Download URL" notes In particular for the download link one could apply the $version placeholder. I guess that these branches is best register as different project ? A short moniker which becomes your http://freshcode.club/projects/name. May contain letters, numbers, hyphen or underscore. Elm 2.4ME+ is based on Elm 2.4. Yeah, I'm sorry. But freshcode doesn't provide actual branch support either. It's rather uncommon for smaller projects to maintain two distinct version trees. So the submission page assumes there'll be a "2.5.001" and a distinct "2.4.001" version for instance. The version numbers are mostly free-form. So you can in fact include the branch information there. For instance with a project id of elm you can submit version numbers of "ME+2.5.alpha37" and later "2.4ME+ PL125" as release. Obviously the project listing will always only show the download/source URLs to the last entered release. If the version numbers differ in filenames, I'd advise just using plain URLs (without $version placeholder). In other hand project "elm" is different. I do not claim to own it. And it needs different description. There on project elm was versions "2.5.7" or latest seems to be named "2.5 PL8". There is no possible give "printable release version" what is different than catenation "$project $version" ? "Elm 2.4ME+ PL125 (25)" "Elm 2.4ME+ PL126 (25)" "Elm ME+ 2.5 PLalpha36" "Elm ME+ 2.5 PLalpha37"
That way at least "Recent Releases" listing have same version names than what program shows. Yes, this is little messy. You worry a little too much :) All the fields are basically treated as description fields, including the version number. Of course you'd use elmme then as project ID for clarity. And if the project title is already "Elm Millenium Edition" you could probably leave out the redundant "Elm" prefix from the version field. If you maintain this yourself anyway, the exact serialization or the historic version scheme shift is not as important. As long as people know which version is current, it's all good. While of course overlong version numbers should be avoided, the technical length limit is over 30 characters (so covers your case too). Version numbers are only cleaned up using a input::words() filter internally. This means A-z, 0-9, . and - or spaces ␣ etc. are retained. A few special characters like + as well. However parens ( ) or the # hash would be removed. So in your case the PL126 (25) suffix might better be written as PL126-25 right away. However, don't worry too much about this. While the version field is somewhat of an exception (changing it usually publishes a new frontpage entry); you can otherwise edit project descriptions at any time. Unlike with freecode, you see the submitted text instantly, and can reedit as often as you like. Since you have a summary download page, the version number used here is not going to shroud this either way. -- If you feel it needs any cleanup later, just flag the entry; things can always be augmented or merged in the database. I ended to use "elmme25" as project id, "ELM ME+ 2.5" as title and "PLalpha37" as version. Hey, thanks again for your time. This scheme/project versioning approach looks indeed most user-friendly. Sorry about the forum :/ - I'm working on the JS flippiness.. I added another with "elm24me" as project id, "ELM 2.4ME" as title, but without version. Seem that still entry to "Recent Releases" was generated. There are versions, but they are not very recent, so tried to avoid claiming that now is released new version. That's intentional. Projects without release number will still be visible. 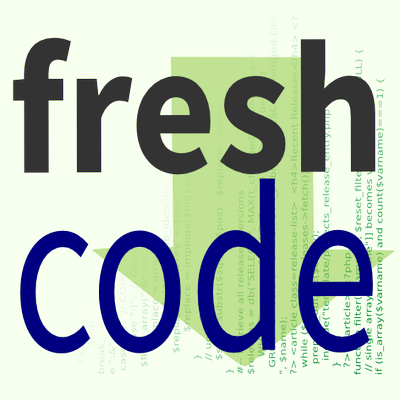 Since freshcode.club is somewhat in its infancy, and reregistration from freecode.com projects is expected; even older project versions are welcome. I've just set it to "hidden" on the frontpage now. It'll still show up in the search pages / tags etc. The last release is on 2005 and I think that the first release was 1986. However parens ( ) or the # hash would be removed. "Elm 2.4ME+" is (indirectly) based on "Elm 2.4" and that "(25)" was saying that "(security) patch PL24 -> PL25" of "Elm 2.4" was applied. So that is somewhat historic tag. Thanks for the note. Fixed it back. Now that "Elm 2.4ME+" shows correct release name "PL127 (25)", but now it show that this is entered "29 May 2016 13:43" when this release actually was entered at 2015 to freshcode.club. I've fixed it manually. I guess the original change was reverted after the server update a few weeks ago. Going to look into that.. Allowed version meta characters should be ~+()#/@: now. Sorry, everyone! We had a server outage last week. And it took some time to migrate everything. Now everything's been moved to a newer KVM setup. Still with the same VPS provider, cause their support was excellent. And the latest database snapshot was still intact. Autoupdating just got a bit delayed. Also not to worry, with freshfoss / fc-mirror / etc, there are enough distributed freshmeat successors meanwhile.. I just recognized that the mirror functionality I have installed at http://freshcode-mirror.opensourcestore.org/ is broken. Can I update the mirror script files from current release? If the updated entries still appear, I don't think the rest of the syncing fails. There's just a few missing images. Your screenshot update script just polls for non-existant projects. cmarkc was renamed to cmark.c IIRC. And the empty .jpeg is probably a missing project name somewhere. Maybe the mirror code doesn't use the recent RewriteRule set. I've introduced faux file extensions for project names after branching that off. So you might want to update some core files like .htaccess and aux.php indeed. The CLOUDFLARE_* stuff is only used for the website stats. You should disable that cron part perhaps. Hey, let's just set up a screenshot archive instead. That's probably easier than fetching all images one after another. I'll setup a cron script to generate http://freshcode.club/img/screenshot/ALL.txz instead. Just a quick note. There's going to be a bit of planned downtime on Monday, 2nd November. The VPS is being updated or something something software update. Hi, first a big "thank you" to the freshcode developers team for this excellent service! It looks like I mistyped or confused some other way my password when I submitted my project, and now I do not seem to be able to add a new release, which puts me in a somewhat awkward situation. To tell the truth, I have been thinking about submitting the project a second time under a slightly different name (and this time without lock), however before clutching at this no less awkward straw I felt like asking if I missed something obvious. Since I might not be the only one to suffer a sudden fit of Alzheimer's in the summer's heat once in a while, I thought I might put the question here as well. Sorry for bothering you with this, and a nice week-end to all of you! There isn't yet any password reset function. Mostly because there are (purposefully) no real user accounts and email addresses in the database. I found your project. And updated the password field. Just try again now with your original password. Otherwise, simply send a mail to info@freshcode.club. Best from the same address your GitHub or SourceForge project is registered to / or your project@domain even. And I can just remove the password/hash for example. It should be for tweets around open source. It's not only for release information, but related to all around oss. Now usually frontpage time for each project should at least be 2-3 hours. But this weekend it might look a bit like rush hour. Sorry! -- So perhaps hold back fresh project announcements till Sunday. This isn't completely done. But starting from now, it's possible to use a plain password to lock up project entries. OpenID isn't overly popular, so we're going back to basics here. Visit the / login page. (It's visible on purpose. FCc isn't your banking account site). and click the green lock link under "Publish". That'll fixate a weird text string in the lock field. Which is quite simply your personal password hash. So, I've been deliberating this for a while. What our database still lacks is an alternative short project summary. Besides the title and the full description field, there should be a shortened abstract for each project. Many project maintainers already use longer titles such as "GSomething - Foos the bar, and bazzes..."
Which IMO is a valid workaround for the current contraints. It kinda breaks the frontpage listings though. So titles are artificially snipped at 70 characters now. This just came up (again, I think) when discussing the JSON submission API. The old freecode API exposed a "oneliner" field, but actually didn't use it much in the UI. The / Browse list would be more useful with short summaries. In particular the RSS feeds would benefit. Now what I'm not quite sure of is how to nicely fit it into the frontpage releases. The olden Freecode-style layout doesn't really help there. → If you have a suggestion or mockup on how the frontpage should look with a short extra summary for each project, please share. T! Align where freshcode.club should be going organisation-wise and structurally. Refine the export feed formats, or database structure (which are currently pretty much the same). Coordinate collaboration with similar efforts. Bring forth a more contemporary website layout. And obviously FLOSS developers are also invited to e.g. Announce new/planned projects (because the main site is only for actual released software). Or whatever else comes up your mind. Currently project names (not the titles) are constrained to foo-bar or baz_2000 style identifiers. Would it make sense to permit e.g. http://freshcode.club/projects/foobar.py names as well? There's no imminent need, it's just for semi-presentational purposes. Could reduce packaging style prefixes like "py-imlib" and "perl-imlib". There aren't that many potential name conflicts according to the Freshmeat database. It's a more programmer-esque and minor presentational change (from the freshmeat heritage). Edit: done. All projects can now use basename.lng as project id. Since GitHub only provides a somewhat stale trending repository list, we now have a project release overview (shortened version in the frontpage feeds). http://freshcode.club/github-releases lists tagged announcents, and somewhat eases uncovering well-maintained projects on GitHub. The filters still need some improvement, obviously. Just like the GitHub filter, there's now also a /launchpad-releases. Interestingly more projects actually utilize the changelog feature there. While “fcc” is already somewhat known amongst us programmers, it doesn't quite match up to the former popularity of freecode/freshmeat with end users. The technical headline is intentional. And it's restricted to English-language searches for now; also set to show up on AdSense blogs/etc only rarely. And personally I'm not a big fan of Google ads still, because … user tracking. Natural backlinks from project homepages make just more sense long-term anyway. I tried to slashdot a small hint, but that was declined. So simply add a hint for each visitor at the start page to kindly help in spread the word. And Google already counts 6,519 total backlinks. There is space that result of "Browse" button is shown on several column. Now result is shown as one column which uses quite small part of screen. Depending of client there is space for several columns. On desktop at least for 2-4 columns. And your layout does not seem anyway work very well on small sizes. Well that layout seems not work with my small laptop. Ok, it works if I press F11 (full screen mode). At least it is close to usable. Hi again. I've been meaning to rebase the layout on e.g. Bootstrap (assuming that's not the origin of Twitters´ sluggishness). The current layout suffers from the wrong mix of fluidness and fixed boxes. It doesn't work on mobile, and with less than 1000px the sidebar floats into the #main section. I think that it maybe little better if text in project description and changes flow around project picture. Now picture just reduces width of description and changes -box. I've already adapted the screenshot generation for slightly larger and nicer previews. And this would of course impact the description+changelog flow text further. (It often looks okay still with 4-5 lines of description text). So a future layout would probably put the screenshots besides the project descriptions. Possibly along with the tags. → I'm imagining small tag clouds besides projects, which would also help finding projects per language quicker. → And lastly I'd thought about two-row project lists on the frontpage. There's enough whitespace to reuse for that. This would put more project listings above the page fold and thus in the spotlight. thinking about feedback, how much the site or a project is clicked, is it possible to generate a diagram for the clicks per month/week? Giving a small hint about the reach of this site would be a good information. There's no stat counter or anything yet. All I can offer are some access log summaries. This weeks (since monday) access.log shows 3000 visitors to the frontpage, and 1200 on per-/projects/ pages after filtering out search engine spiders. The RSS feeds seem to be quite popular, btw. What we can't tell is how many people directly click to project homepages though. (Which I'd hope to become the main attraction really). Unlike freshmeat there's no URL-tokened click counter for that, albeit a ping= might be feasible and acceptable. But true, more concrete infos make sense. Maybe I'll just set up a proper log analyzer. Though it's probably senseful to have something more customized later to differentiate between active views on current releases and those that aren't on the frontpage. I think, that starting with a simple counter per week in the main page will be a good starting point. Adding another field in the project entry to count page hits may be a simple next step to simply display that counter for the project. Is the meta page currently the only feedback mechanism, or do you know any other place that has emerged as a discussion platform? My forum is yet not as successful as I am like it to be. I mostly thought of meta to be the local feature request survey, because bug trackers are commonly less enticing. As for OpenSourceStore, I originally envisioned it to progress into a neat e.g. online-shop styled Freshmeat alternative - just as the domain already sounds a bit like. Now that FCc seems almost ready for a beta stage, would you be interested in setting up a customized copy/frontend and database mirror? Your existing forum could prominently list the existing discussions in a feed pane (a bit prettier than the article/software links here of course), which might draw more discussion/attention. Or else maybe convert the entries and turn the forum altogether into a user-contributable blog w/ software reviews? I thougt about this, but first I tried to get up some constructive discussion. Maybe a mirror + discussion + some more users with approval permissions are good. I had a look at your feed mechanism and it seems there is no one with a complete copy, may be due to performance reasons. May be there a REST API with paging support and or syndication? A big company that has a business concept around oss may not need such a site, thus it is thought for individual oss developers seeking for support to pay for or providing support by participaing there. So while I am thinking about a concept others started up and doing it before me. I'll investigate some work figuring out what they do and what can be done better. The current traffic is comperatively negligible, as the templates are rather slim, and CloudFlare optimizes and caches away the rest. Only the local GitHub/Archive API polling consumes a few more GB, but that's about it. As for mirroring, there is already /feed/xfer.json?num=500. That'll stay even if the other feeds become static, no performance issue really. Adding a sliding parameter is no effort, but not needed yet. And btw, that JSON feed is almost a raw database dump; thus can be consumed by a trivial import cron job. // Setting up a phpBB or $_SESSION bridge (as alternative to using OpenID) to the freshcode 0.7 implementation should be likewise simple. Can you tell me what steps are required for setting up a mirror? I assume to have to keep my own copy of database to store fed data I got from you, but then how to redirect update and insert requests to the master? If I do not have a database, how to I allow adding releases? Or should this be done at the master site only for simplicity? In all cases I assume to modify at least configuration, but maybe code. It's not yet thoroughly prepared for separate setups, but should be easy to customize. I'm going to branch a mirroring tree (including a robust xfer-sync cron job). As dependency PHP 5.4 / HHVM 3.0 is required at least; wkhtml+imagick for screenshots, and SQLite obviously (it still needs a database, even if project submissions were turned off). Theme-customization might be a bit involving, as the stylesheet got quite broad, but the templates/* shouldn't be. Using it initially as read-only frontend without any management overhead is comperatively simple: the [submit] and [update]/[flag] links can just point back as absolute URLs to FCc. I have send you an private key to the private mailbox at opensourcestore.org. Please try to login to the machine I'll tell you there. I have some problems getting freshcode installed on my developer box. Mainly due to probably misconfigured / unconfigured phar feature in php. I'll try it by reading the phar docs, but you may be faster telling how. I've prepared a freshcode-mirror.tar.gz just in case (just fixed the anon-fossil zip download permissions, sry). but prepares a simple feed/xfer import. Should be easier to set up (empty database included), and just requires PHP 5.4 or something. I encountered the second time a small error when I post a reply. When I have done my reply and follow, it seems I have overridden the post I am replying to. Only a page refresh shows me I am wrong and all is ok. I couldn't yet be bothered to fix the DOM insertion. (Basically the Reply/Edit/Submit hooks use the same API call, but don't differentiate which ul/li node to attach results to). Meta only uses AJAX to deter common spambots (not foolproof, but a sufficient diversion). Albeit for the new summary in the header (got commited a bit too early), the numbers are only approximated conservatively. The for-free CloudFlare API just gives out the last 24h hours. But it's reasonable enough for a quick and unpretentious overview; project and release numbers seem more interesting anyway. Unlike freshmeat there's no URL-tokened click counter for that, albeit a ping= might be feasible and acceptable. Hmm. Seems that ping= exists does not exists on HTML 5 (as W3C Recommendation 28 October 2014). OK, it exists on whatwg's HTML. Seems that ping= exists does not exists on HTML 5 (as W3C Recommendation 28 October 2014). Should be: Seems that ping= does not exists on HTML 5. Mozilla documents it https://developer.mozilla.org/en-US/docs/Web/HTML/Element/a as available. So it's probably just the W3C documents which are out of date. I have setup a - probably first - mirror for the main site with some help of Mario. Performance is an issue I like to measure with your help regarding the usage of the CoralCDN caching. On my home network I experience very slow performance and on my tablet with UMTS it is even worse. Can anyone report on this issue? "Can anyone report on this issue? Here is the link: http://freshcode-mirror.opensourcestore.org"
Firefox can't find the server at freshcode-mirror.opensourcestore.org.nyud.net. ( Looks like it resolves to http.l2.l1.l0.nyucd.net, but http.l2.l1.l0.nyucd.net does not found. As you see DNS gives errors and when IP has got, then there is no response. Not exactly sure how it works. But CoralCDN turns out to be pretty slow for me as well. I've actually used it a few years back for another project where it was working ok. Why it's not living up anymore, no idea. Might just be provider-dependent, at least in my case. There may be issues with my private box, that is running the site. The upstream speed is about one MBit I think. I have added mod_redirect stuff to the server but there is still missing a mod_deflate feature (aka compress). I don't know if this is a solution regarding coralcdn, but it will in general help improve the speed. Another issues are found by using google web page speed tool, so I'll try to fix stuff and report on stuff to be merged back. Seems that "Search" button does not found project, if project id is given as search term. At least "elmme25" and "elm24me" does not work as search term and they are project IDs. "elm" works, but that is on project title. And of course it works if I use full title as search term, ie. "Elm ME+ 2.5" and "Elm 2.4ME+". We didn't have many cases of that yet, so searching by project ID wasn't accomodated for. However it's easy to add. I'll just add name to the list of database fields to search in. More concretely, this features isn't yet based on an actual search function (SQlite FTS et al). But often works okayish enough. Update: Committed an initial patch for just matching the plain name field as well. Because the submit form documents just the basics, here is a longer explanation of what each field does. → Project ID: Becomes your project URL name on freshcode. You can use letters a-z, numbers 0-9, hyphen - and _ underscore. It may additionally end in a language tag .py or .cpp for example. It's supposed to be your projects basename in the URL http://freshcode.club/projects/PROJ-NAME. Spaces and inacceptable characters will be stripped on submission. → Homepage: Should be your projects homepage URL, or github or sourceforge reference. → Description: Explain what your project is about. List all the features. It doesn't have to be a lengthy text, but should round-up what advantages your implementation has over similar apps. You can even add future goals, or anything that may capture user interest. → License: Pick one of the existing open source project licenses. If there's no exact match, chose "Other" initially, and flag for moderator attention. Custom license names can be added still. Distributions may often pick "Mixed" instead; if the project is covered under different individual licenses. → Tags: Should list a few categories to describe your project. Add the implementation language, core features, a target audience descriptor (end-user, developers, administrator etc.) if you want. Note that tags should be made up of letters primarily, or - hyphen-separated categories. You can list multiple tags by separating them with spaces and/or commas. Such as c++, python, graphic, editor, image, end-user. You can also pick a few general ones from the Topic/Trove box. → Image: If you have a screenshot or logo for your project on your project homepage, just add an URL to it here. This will be used as preview. If you leave this field empty, don't worry, a homepage screenshot will be generated then instead. → Version: Your current project version. (Leave empty if there isn't one yet). Version numbers may be made up of numbers, dots, hyphes, underscores, and -xyz suffixes. This field however also accepts textual version descriptors. Note that you'll generate a frontpage entry whenever you add or change the version field. → State: Broadly categorize stability or finishedness of your project. → Scope: New releases can be minor or major feature changes or bugfixes. What qualifies as minor or major may be interpreted differently by each project. (For example the Linux kernel adding 100 new drivers might be minor to them, but a small CLI tool changing some behaviour might amount to a major feature change). → Changes: Is a summary of what new features or changes and bugfixes your newest release adds. Write this end-user readable, in a list style, but avoid the * decorators if possible. → Download URL: Is either a link to a zip/tar, or a download landing page. If your zip/tar file releases consistently contain the current version number of your project, then you may wish to utilize the $version placeholder. - So for future updates you don't have to update this download URL again. → Other URLs: You can add further project links. This field accepts a line-wise or comma-separated list of Link-Name = http://example.org/ fields. You often may want to add GitHub or SourceForge URLs here, or a link to the manual/documentation, or version control system. You can just as well list DEB or RPM or APT-PPA download links, or release notes, a user forum, or a mailing-list= entry. → Submitter: Just give your name here, or a nickname of yours. You may additionally (comma-separated) list a registered gravatar@example.com address, or use your username@github, username@sourceforge or username@launchpad. If so, a user icon will be presented later. One of the core features on FCc are automatic release updates. (Can't stress this enough ;). The project fields however look more complicated than it actually is. If you've got a CHANGELOG or NEWS file (in your repository or homepage), than just enter that under Autoupdate URL. And set the method to [Changelog]. * Added new feature xyz. * Fixed bug with --foobar. Where [\d. ]+ is the most common placeholder to match numeric-dotted version strings. All projects can utilize a Changelog or a homepage News section to keep listings automatically updated. Previously the autoupdate process ran nightly at 3:15 GMT. But it dumped all found version and project changes at once. This reduced frontpage publicity on busy days. So I've recently adapted this process. New releases will now be spooled, and instead get published with at least 2 hours spacing each. While this may delay announcements half a day further, it prevents release lumping. And it IMO gives each project release a fairer time slice topmost on the main index. All our project releases will be squeezed into 140 characters (including a direct project homepage link). I've been planning this for a while, just went forward with a preliminary version for now. One of the inherent goals of freshcode.club is to relieve project maintainers of a few tedious tasks (hence e.g. automatic updates per Changelog). And extra Twitter announcements are one of them (not many projects do, due to the setup effort -- or at least I for one never bothered). The twitter bridge cronjob is currently using twidge for simplicity. The supported URL shorteners do not allow for image screenshots to be included; Twitter seemingly requires the online t.co for that. Update: Switched to twurl, so at least the mini-screenshots are now embedded. Update: @projectname mentions are now also included in Tweets. Please add two license tags regarding the MPL. MPL 1 was created by Netscape and is not compatible with GPL, etc. MPL 2 is a simple Copyleft license that was explicitely designed by the Mozilla foundation to be compatible with GPL, LGPL, AGPL. That's a major difference for code reuse and thus important criteria for categorizing FLOSS projects. So please allow the MPL dropdown to differentiate between the two versions. In this very case I'd retain the "MPL" moniker for the current version, and add a historic "MPL 1.x" entry somewhere in the list below. PS: Also if anybody wants to have a specialty license listed, just pick "Other" initially, and flag the entry for moderator attention. Custom license names can be added individually per project. Thank you for creating an maintaining this site! It would be nice if there was RSS feeds available for each project and for the entire site as well. Hi, and thanks. There are a few RSS feeds already, they're just a little hidden. Currently freshcode.club is stylistically close to the late freecode. It's however kinda obvious that projects weren't presented prominently / pivotal enough. One minor difference is that homepage links are slightly more accessible already. Not just the small icons do, but the preview images directly point to project homepages. The overall frontpage design IMO however still weights the directory too high. Our inherited ProjectXy 1.2.3 title bar links need a rethought. There's no plan to make projects/ detail listings go away. They still contain many useful infos/links. Getting users quicker and more unobtrusively to the respective projects homepage should be priority one however. If you want to share some ideas (or better even: a mockup), please tune in. Freecode.com was long established as central service to announce open source software releases. In June it suddenly shut down. Larger projects still can rely on blogs and news sites to circularize progress and new versions. Smaller and new open source projects however depend on distinct publication channels for recognization and attracting contributors, to avoid getting drowned amidst millions of other GitHub repositories. This is where freshcode.club is meant to pick up again. No user accounts. Instead submitting relys on OpenID logons, which are easy enough to aquire and use. It's currently not even required. Automatic updating is another important core concept. Instead of relying on manual submissions, project authors can just reuse their Changelog, or adopt a simple releases.json for publishing. All content is CC-BY-SA covered. There's quite a few areas that need further improvement. Such as the tagging scheme (both the UI as well as the Trove classifiers). While it's a bit too early for featuritis, having a ToDo survey is not. So what would you like to see?